Building a picnic area in your backyard is a great way to add to the value of your homes, and provides a place for your family to get together. It is also a great option for people who want to invite dinner guests over, but their home is too small. An outdoor picnic area allows you to better enjoy your backyard and enjoy the relaxing summer nights outdoors. Creating the perfect picnic area is not as difficult as you may think. The first step is to consider what type of theme you want to use for you outdoor space, such as modern, rustic, simple, open, romantic, Mediterranean, or Victorian. Your options are virtually limitless. Once a theme is selected, it will help you determine that type of fixtures, furniture and accessories you want to include in your area. You also want to think about what the purpose is for this area. Do you plan to use this area just for your family to dine together during the warmer months, or are you planning to use this area for entertaining dinner guests? Making this determination will help you know how large to make the picnic area and how much seating you need. Designing your picnic area does require a little planning ahead of time. This will help you save money and ensure your newly designed area meets all of your needs. There are several things you should determine before you start working on your new design. Flooring. The type of picnic area flooring you want to use is probably one of the first things you want to determine. If you already have a deck or patio outside, you may consider using some of that space for your picnic area. If not, then you must consider if you want to build a deck or use other types of flooring, such as concrete, pavers, bricks or stones. Shelter. 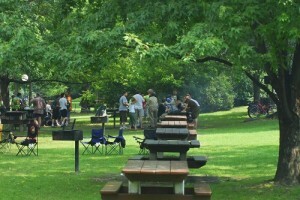 You need to determine if you want to keep your picnic area open or add a protective covering. If your picnic area is close to your home, you can build a roof or install an awning out over the area. If it is not near you home, you can consider installing a pavilion, pergolas, cabana, canopy or just use a table umbrella. Lighting. If you plan to use your space in the evening time, which is highly advised, you will need to consider what type of lighting to use in your picnic area. The expense of using candles and lanterns can add up over time. While it may be more expensive originally to run an electrical line to your picnic area, it will probably save you money in the end. It will also provide better lighting and allow you to use the space more often. Cooking. No picnic area would be complete without a place to cook. This can be a simple charcoal or gas grill that you can use to cook, or an elaborate built-in grill. The type you choose may be dependent on your budget, but remember if you cannot afford a built in grill right now, you may be able to install one in a few years. Seating. 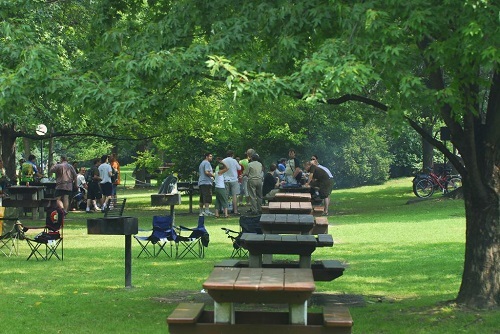 Seating is one of the main components of your picnic area. You need to have enough space at the table and enough seats to accommodate at least the number of people in your family. Additional chairs and tables can always be used if you are having a dinner party. Traditional picnic tables are often the best choice for any picnic area. They come in an array of different shapes and size, so you are sure to find the perfect one to fit your specific picnic area. Be the first to comment on "How to Build a Perfect Picnic Area in Your Backyard"